Hailing a taxi? You could be the next contestant on Cash Cab. Answering the pleas of more than 13,000 fans on a Facebook page called “Bring Cash Cab to Chicago!” the Discovery Channel has started filming a local version of its popular taxi trivia show. Reps for the network and the show’s production company, Lion Television, tell us little beyond confirming that the titular cab is prowling the city’s streets, ready to pick up unsuspecting contestants and ask them questions en route to their destinations. So we went to another source: the handyman who gives a seemingly normal cab the push-button potential to transform into a glittering game-show set. Prop fabricator Marshall Wilson hid the cameras for NBC’s To Catch a Predator and helped construct Blue Man Group’s tube instruments. 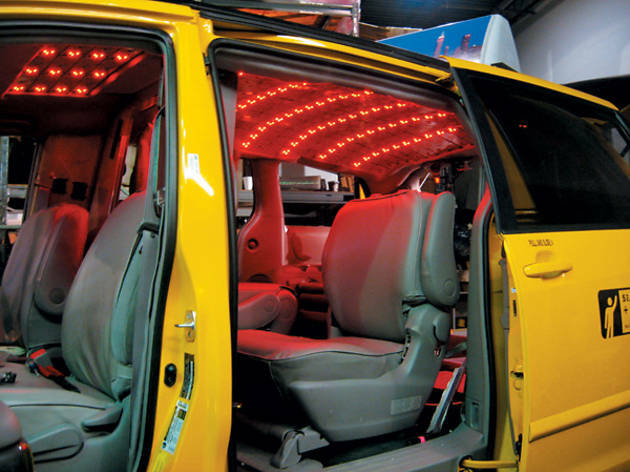 In October, he traveled from the Brooklyn headquarters of his seven-year-old company, Wilsonbuilt, to a Chicago taxi garage to install a custom polycarbonate panel holding 1,224 LEDs onto the interior roof of a Yellow Cab. Wilson knows the ins and outs of the Cash Cab cars better than anyone: He’s built two for New York’s show and one for Toronto’s. With his help, we compiled some taxi-spotting tips to boost your chances of becoming a contestant, something the 41-year-old would never want to be. “I’m not good at trivia!” he says, laughing. License plate Chicago taxi license plates include a number followed by the letters “TX.” But according to photos Wilson took while doing the lighting-rig installation, the Cash Cab vehicle has a plain old Illinois license plate: L53 5925. Host How many blond-haired, blue-eyed women do you see driving Chicago taxis? Exactly! The Second City e.t.c. cast member Beth Melewski—the Chicago surrogate for gregarious NYC Cash Cab host Ben Bailey—should be easy to spot behind the wheel. 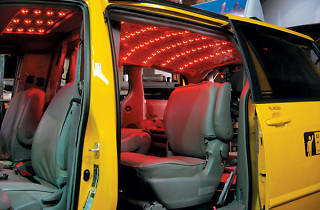 Route The Cash Cab minivan shouldn’t stray too far from the North Side and the Loop, says Jeff Feldman, president of Taxi Medallion Management, which oversees Chicago’s Yellow Cab fleet. Fans have reported spotting the cab on the Gold Coast and in Lakeview. The typical New York Cash Cab path sticks to touristy areas, such as Times Square. So, while it’d be interesting to see who Melewski might pick up in Stranglewood, we’d recommend staking out the Mag Mile or Navy Pier.